It's the Vegan Month Of FOod! Or vegan mofo for short. I'll be spending the month of September doing something I rarely do: cooking and eating French food. Hold on to your bérets! 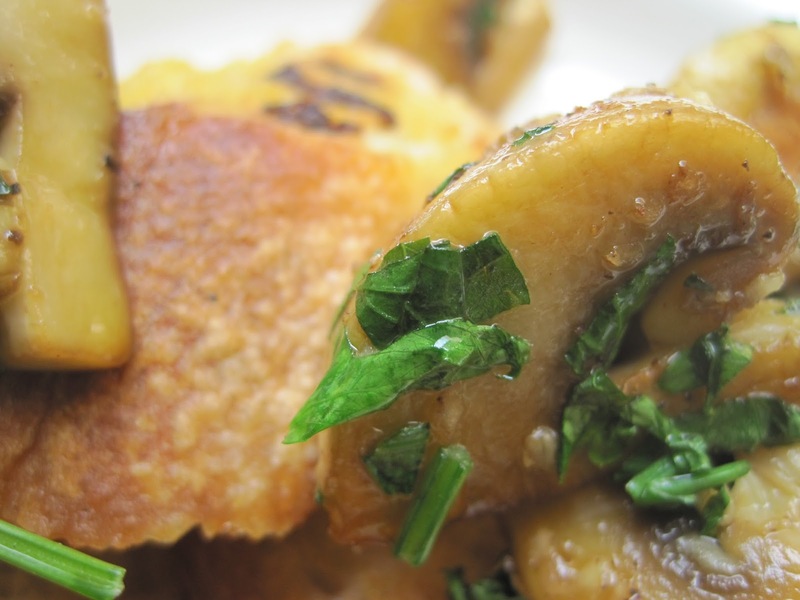 Let's get started with something super duper French: (not) snails. I have a theory that the only reason people eat snails is that garlic and parsley and butter are delicious. Save a snail and give the same treatment to mushrooms. Way less gross. I got the idea for the mustardy toasts from Leith's Vegetable Bible. It's a great book: you should probably buy it. 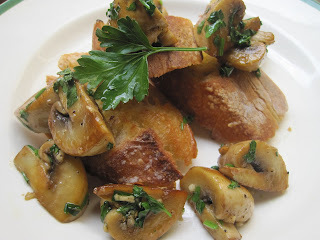 Fry up the mushrooms in the olive oil until golden and juicy. Meanwhile, combine the mustard and olive oil in a small bowl. Spread on each side of your baguette slices. Place the mustardy bread in a griddle pan and cook till toasty. Repeat on the other side. Add the garlic and parsley to the mushrooms, along with 1 tsp additional olive oil. Cook for one to two more minutes. Season. Pile the mushrooms on top of the toasts. This makes enough for a tasty lunch for one.